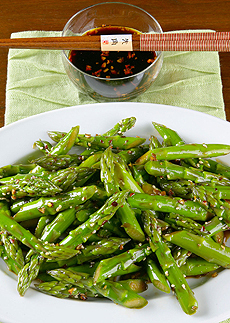 Sweet & Spicy Szechuan Asparagus puts a new twist on the Chinese classic. Photo courtesy California Asparagus Commission. Even if you’ve never cooked anything Chinese, you’ll be able to make this easy asparagus recipe—in a sauté pan. This is Page 12 of a 12-page article. Jump to the recipe below. Click the black links below to view the other pages. Cut asparagus into 3 inch pieces on the diagonal. In a small bowl, whisk together soy sauce, rice vinegar, sugar, chili flakes and pepper. Set aside. Heat a large sauté pan over high heat. Add 1/2 cup water and asparagus. Cover and cook until asparagus is still crisp to the bite, about 2 to 3 minutes. Uncover and pour off any remaining water. Add oil, garlic and ginger to the pan with asparagus. Sauté until lightly browned. Add soy sauce mixture. Bring to a boil. Cook until the sauce coats the asparagus. Sprinkle in toasted sesame seeds. Transfer to a serving platter. Serve immediately.